When you begin to look for an agency specialising in web design in Bristol, you’ll find plenty of choice. But how do you have confidence in your selection of provider? Here is a look at some key signs demonstrated by great digital agencies. A great digital agency will be naturally good at communication, and you should have a nominated lead that actively manages your account, provides regular updates and is proactive in communicating with you as the client. Be wary of an agency that provides no named lead, never seems to be available for contact and struggles to communicate effectively with you as a client. Great digital agencies will have a superb portfolio of work that demonstrates their skills and shows off the best of their work. Look for an agency that is ready to talk you through it and which displays sector expertise in your field of work. This will give them insight and knowledge about the typical issues that affect your business and the opportunities that a good website will bring you. A good digital agency such as Aardvark Creative will have a recognisable project management approach which they can talk you through. This may be based on a recognised system such as Waterfall or Agile or be an in-house approach, but it will be clear and work with your own approach to project management, allowing you to always understand where your project is up to and what is next. For many firms, an agency which can deliver to an agreed budget is an absolute essential. Make sure you get an agreement for a build at a particular budget in writing and a clear specification of work delivery so that both parties are clear on what is going to be included in the price. Of course, remember that you will generally get what you pay for with a digital agency, and cutting-edge skills do come priced accordingly in the market. 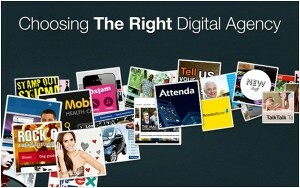 However, there can be variations within the digital industry. When reviewing a number of agencies to make a decision about your new digital partner, make sure you are systematic in your approach, and use an objective system of scoring. Carry out due diligence on any contender, and discuss your decision with other key internal staff.